Leaf beetles are just about the biggest family of insects. The family name is Chrysomelidae and it has 35,000 species from 2,500 genera. All these different species feed on plant tissue, but most eat specific plants. This frequently makes them well-known garden and agricultural pests. Some of the more common leaf beetles are the elm leaf beetle and the Colorado potato beetle. The elm leaf beetle feeds on elm trees in your garden or around your neighborhood. A heavy infestation will affect the elm tree's appearance as the beetles munch their way through the leaves. This leaf-eating behavior makes the leaves shrivel and turn brown. Gardeners with viburnum shrubs may find they have to deal with the viburnum leaf beetle, who will devour the leaves. The bean leaf beetle is another unwelcome garden pest, especially in the warmer, southern regions. 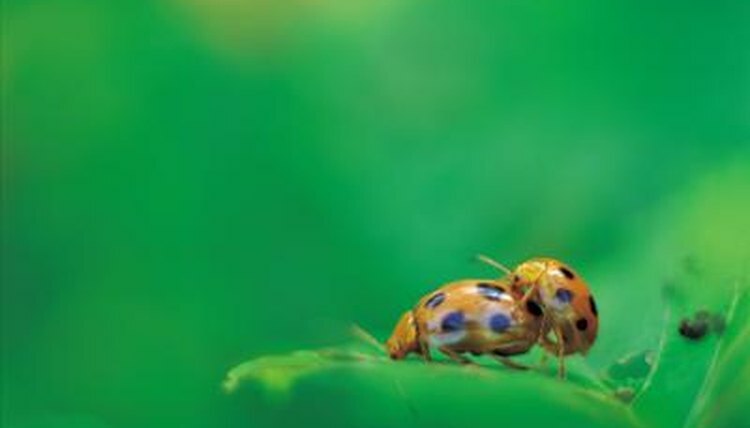 Making your garden ladybug-friendly is one way to combat leaf beetles, if you prefer a natural approach rather than insecticide use. In winter, these bugs are likely to find their way inside your house and stay until it gets warmer outdoors. Thankfully, they don't reproduce indoors and they are more of an annoyance than a threat. There are leaf beetle that eat potatoes, asparagus, corn and various cereal crops, so they aren't popular with farmers, and with many gardeners growing vegetables. The Colorado potato beetle is a particularly unwelcome pest who doesn't just eat potatoes; he also like tomatoes and eggplants. The larvae tend to eat the roots and leaves, while the adult leaf beetle feeds more on the leaf and flowering parts of plants. The dogbane leaf beetle has a metallic, shiny carapace that makes him rather attractive to look at. However, this bug feeds on dogbane, Indian hemp and milkweed plants. His diet allows him to produce a foul-smelling toxin that discourages predators from coming near him. The dogbane beetle is quite numerous along the Atlantic coast from Texas up to Saskatchewan in Canada and is typically found in prairie and grasslands. In Namibia, another leaf beetle produces toxin by feeding on the leaves of the Commiphora tree. Only the larvae are toxic and Kalahari bushmen squeeze the larvae's poison onto the tips of their arrows. The imported willow leaf beetle arrived in America in 1915 from northern Europe. They mostly live on the east coast of the U.S. and Canada. As the name suggests, they eat willow and like feeding in groups. The larvae tend to only eat the younger, fresher, green bits between a leaf's veins, creating a skeleton effect. Apparently, tougher parts of the leaf wear down the beetles' mandibles, so only adults chew on those parts. The leaves may turn brown if the infestation is sufficiently large, otherwise the damage is more cosmetic than deadly.